Most lawyers don’t know how to use exhibits effectively to persuade the jury. So we have started a series of the practical rules of using your exhibits. You might call them The Persuader’s Real Rules of Exhibits. This first article in this series sets out the “The Persuader’s Real Rules of Exhibits” 1 through 4 – the use of exhibits during your opening statement to the jury. Rule No. 1: You can show the exhibit to the jury anytime after it has been received into evidence. It’s against the rules of evidence to show a jury something that has not been placed into evidence. But — the reverse rule is the Persuader’s Rule — you can show the exhibit to the jury anytime after it has been received into evidence. The Persuader’s Rule means you can show the jury your exhibit during your opening statement, if you handle it right. Get ahead in the race to a favorable decision. Put your major exhibits in front of the jury as soon as possible, together with your explanation of what it shows, and why they should pay attention to it. Whether you are on the plaintiff’s side or the defense side, the Persuader’s Real Rule of Evidence is to start showing the jury a couple of your major exhibits during your opening statement. During your opening statement you can talk about your exhibit in an uninterrupted, persuasive, flow. Here, before any testimony, you can show the jury how and why “the physical evidence” demonstrates you are right. 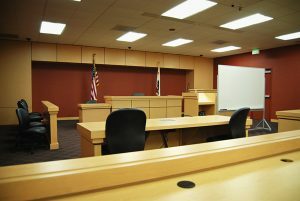 If you want to show the jury an exhibit during your opening statement — all that needs to be done is to have the judge receive your exhibit into evidence before your opening statement. Rule No. 2: You can use a motion in limine (offer of evidence in limine) to get your exhibit admitted. This is the second article in the series. It deals with the showing of your exhibits in an effective way during a trial; so that the jurors’ long-term memory holds your exhibit. Rule No 5: Respect the limits of the prefrontal cortex and short-term memory. A. Exhibit the exhibit to the jurors’ senses, for at least eight (8) full seconds.